The goal of virtual is to create an immersive experience and too many times the audio is a forgotten component towards that goal. Since having good audio is so crucial — or at least bad audio is so detrimental — the best practice is to use a third party mic, like a lav mic, to record the audio from interviews that will be played over the video. 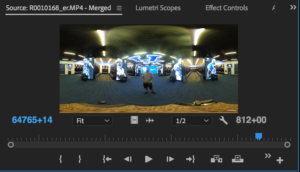 Adding this audio to the video is easy when the interview is done off screen, but it can get tricky when you are redubbing audio that the 360 camera has already picked up. 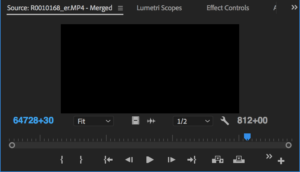 Thankfully Adobe Premiere Pro has some built-in tools to help with this process. The first step in merging the recorded audio clip with the video clip is like with any project, just making sure that all of your material is organized and easily acessible. 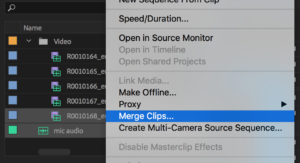 This will help with the merging of the two clips, especially if you are matching up numerous video clips with one audio file, which is what is being done in the examples laid out below. This can also be done using the drop-down menus, as shown below. After you do this a prompt like the one below will show up. 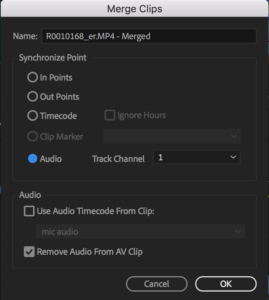 You need to be sure to set the synchronize point to audio, so that Premiere will know to process the two clips and match up at the right spot. 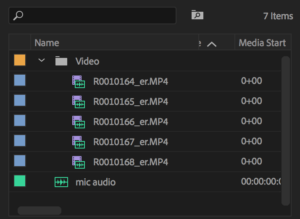 You also should make sure that the “Remove Audio From AV Clip” is selected so that you only get the higher quality audio from the mic in the video. At this point, you are essentially done as long as the audio clip and video clips you started with were the same length. But just in case you are dealing with multiple shots and only one audio recording, there is still more that needs to be done. If you are matching up multiple video clips to a single audio clip you will have to repeat the process above for each individual video clip. 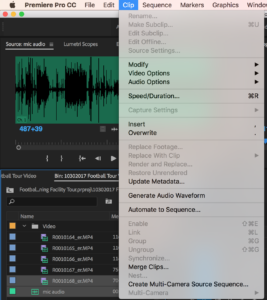 You will also have to trim the resulting merged file because it will be as long as the audio clip because it will just relay the video over the adjacent spot. So you will see a lot of nothing until you trim the clip to only the part where the video is matched with the audio. Now you have a video clip with the added benefit of better audio from a mic.